Conor McGregor is not one we should be celebrating, and other thoughts . . .
Conor McGregor was cheered at TD Garden before the Bruins-Blue Jackets game Saturday. A few things I care about . . .
■ At one parade in Boston, so many fans rushed the streets to be near him that he ended up leaving early. At another parade in Chicago, his presence completely overshadowed that of his marching partner, who just happened to be the political leader of his native country. An appearance at TD Garden to drop the puck for the Bruins’ Irish night shenanigans against the Blue Jackets sent a sold-out crowd into sustained frenzy. Yes, last weekend underscored just how popular Conor McGregor is with fans, with St. Patrick’s Day celebrations putting a spotlight on the mixed martial arts star from Ireland. 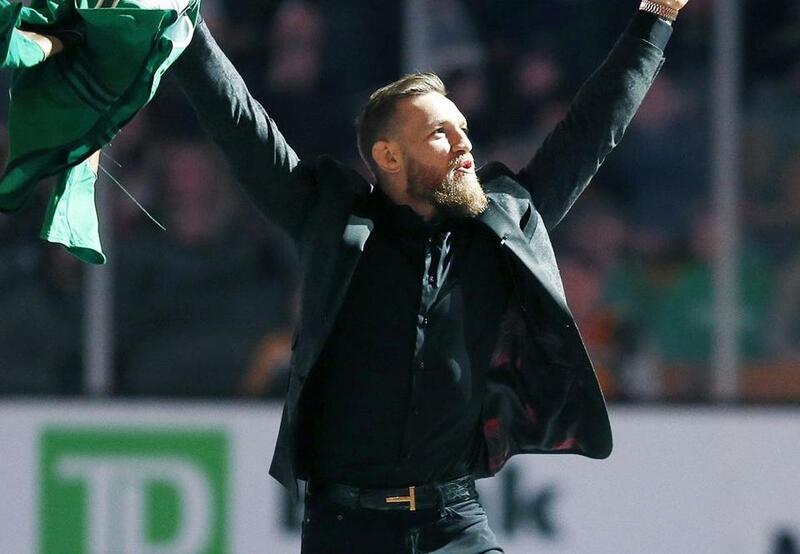 He was celebrated as an ambassador for that beautiful country, and even though he was in Chicago leading that parade alongside Irish prime minister Leo Varadkar, it was in Boston that McGregor truly felt the love. He was welcomed into the Bruins locker room both pregame and postgame (he can be seen on his YouTube channel wheeling in a cart of his own signature whiskey to share with players) and showered with love during the city’s parade. Forget about coloring me green. Color me disgusted. Wasn’t that McGregor who was arrested in Florida earlier this month, charged with felony strong-armed robbery and criminal mischief? McGregor reportedly slapped a phone out of a fan’s hand and stomped on it repeatedly, apparently angry the fan had attempted to take a picture of him. Both parties apparently were leaving Miami’s Fontainebleau Hotel in the wee hours, and after the altercation, McGregor took the phone and left with it. Wasn’t that McGregor who once was suspended from fighting for six months and fined $50,000 for his involvement in a post-fight brawl with rival Khabib Nurmagomedov? Wasn’t that McGregor charged with assault, attempted assault, and criminal mischief after another incident last April, when he was part of a group that allegedly attacked a bus ferrying UFC fighters to Brooklyn’s Barclays Center? Wasn’t it McGregor described in a recent column by Sport Illustrated legal expert Michael McCann as having avoided “serious immigration consequences” after the incident in New York, but who might not be so lucky a second time around and have future problems getting permission to fight in the US? Did McGregor really represent the best option for decision-makers with the Bruins and the city’s parade to represent Ireland on St. Patrick’s Day? It seems to me he feeds into some of the worst stereotypes of Irish people (full disclosure: my mother was born in Ireland, as were both of my paternal grandparents), with his incessant hawking of his Proper Twelve whiskey and his penchant for fighting in conjunction with late-night reveling. The video clips he shared on social media showed him delighting over the Boston parade crowd’s exuberance as well as delivering a speech to the Bruins that included some, shall we say, colorful language. Of course, that should not disqualify him from public appearances, but the sum total of McGregor’s behavior, for me, is not one to be lauded or celebrated. ■ How do you like women’s basketball now? For years I’ve heard from women’s basketball detractors that the dominance of the Connecticut women was bad for the game, making the NCAA Tournament boring and predictable. My counter argument was always that a rising tide lifts all ships, and UConn’s excellence was something not simply to be celebrated, but in the best case, emulated by programs all over the country. When the NCAA bracket came out on Monday (and what a mess that was, having been mistakenly leaked early by ESPN), UConn was revealed as a No. 2 seed, the first time since 2006 it hasn’t been a No. 1. The shock on Twitter made for an entertaining few hours, with outrage over a 31-2 record and No. 2 national ranking leaving many to wonder how it had happened. The easy answer is in the conference UConn plays in. The Huskies are 120-0 in the American Athletic Conference since it grew out of the dissolution of the old Big East, and the hit to strength of schedule definitely hurt the Huskies. UConn coach Geno Auriemma took the news about as well as you’d think the irascible veteran would. ■ From big Bradley mistake to wise Bradley correction. Way to throw cold water on your own great story, Bradley, but way to clean up your own mistake, too. After earning an NCAA bid, the men’s basketball program continued its ill-advised feud with beat writer Dave Reynolds of the Peoria Journal Star, limiting his access to players because of what they believed was overly negative coverage. That’s silly enough, but in chastising the reporter for not promoting the “Bradley brand,” the school showed just how misguided it was. Obviously, a reporter has no responsibility to sell a brand. But kudos to school president Gary Roberts, who upon learning the details admitted the school was wrong and reopened access. Still, what a shame the incident overshadowed the joy of a March Madness appearance. ■ Could this be the year Rory McIlroy finally wins the Masters? Seems harsh for a man who hasn’t yet reached his 30th birthday, but after so many near-misses at the only tournament he needs for the career grand slam, not unfair. McIlroy seems in top form, winning The Players Championship last weekend with two clutch late birdies. ■ Is there an athlete more dominant in any sport right now than Mikaela Shiffrin? Shiffrin has an astounding 17 victories this season, and in winning the giant slalom world title last weekend, she became the first skier, male or female, to win four globes in a single season: the slalom, giant slalom, super-G, and overall. Watch out, Serena, Shiffrin is making skiing look as easy as you make tennis look. ■ Book notes from a book nerd. Haven’t read these two yet, but past experience leaves no doubt I will love the words from two New Jersey friends. If you enjoy page-turning suspense, pick up “Run Away” by Harlan Coben. Or if you need a sports fix, go for “Inside the Empire, the True Power Behind the New York Yankees,” a combined effort from Bob Klapisch and Paul Solotaroff.